A year ago I wrote on this blog about the escalating numbers of people dying from overdoses involving the extremely potent synthetic opioid fentanyl and its analogues. Today, a new analysis in JAMA by epidemiologists at NIDA and the Substance Abuse and Mental Health Services Administration reveals the scope of the crisis, and the rapidity with which the opioid problem has broadened from prescription opioids and heroin to include their much more deadly synthetic cousins. Using mortality data from the National Vital Statistics System, the researchers were able to show that involvement of fentanyl in opioid overdose deaths rose from 14.3 percent in 2010 to 46 percent in 2016. That is nearly half of opioid-related overdoses. Fentanyl is now involved in more deaths than prescription opioids (40 % in 2016) or heroin (36.6 % in 2016). (The drug categories are not mutually exclusive—in many deaths, more than one drug is involved.) There is preclinical data to suggest that combining fentanyl with heroin may even further enhance its lethality. 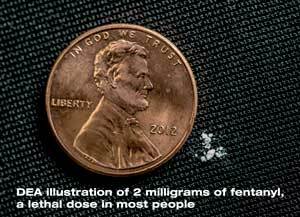 Although some users seek out fentanyl, it is often ingested unintentionally. It is commonly used to adulterate heroin as well as counterfeit prescription pain pills and sedatives that are purchased on the street. Increasing numbers of overdose deaths among cocaine users may also be related to fentanyl-adulterated cocaine. Because it is so highly potent, fentanyl is more easily smuggled into the country, and because it is so cheap to produce, drug traffickers have increasingly turned to fentanyl as a profitable product. According to a report released by the Centers for Disease Control and Prevention last month, two thirds of the 63,632 drug overdose deaths in 2016 involved some kind of opioid. Unfortunately, comprehensive toxicological testing is not performed in many cases, or the results are not recorded on death certificates, so the reported numbers of fatal opioid overdoses and overdoses due to fentanyl might not capture the full scope of the epidemic. Because of fentanyl’s extremely high potency (it is 50-100 times more potent than morphine) and its ability to readily enter brain tissue, it can be lethal to breathe air with atomized fentanyl in it or touch a contaminated surface. Also, due to its high potency and slower elimination from the body, overdoses, when caught in time, may require multiple administrations of naloxone. First responders must be prepared to administer more than one dose. Those who are revived must still get medical attention, as a new overdose can occur when an initial dose of naloxone wears off . The opioid crisis has proved to be a rapidly moving target for public health officials, policymakers, and the healthcare system. The escalating death toll from fentanyl and its analogues adds to the urgency of addressing the problem in multiple ways: from wider access to medication-assisted treatment and overdose reversal, to improved provider education about pain management and addiction, to community investment in prevention programs. The new study also underscores the need for ongoing and accurate data collection to rapidly identify the source of the most important drug threats at any given time. See NIDA's press announcement - "Nearly half of opioid-related overdose deaths involve fentanyl" and our Fentanyl information page. It's critical to clearly identify "Illicit Fentanyl" as such. Please don't use the term Fentanyl to identify Carfentanil or Carfentanyl. It is inaccurate and promotes Opoidphobia. Articles need to be written responsibly to not increase prejudice against people who need Opoid Therapy to manage Pain. Millions of people with Intractable Pain Diseases are suffering due to misinformation being presented about the Opoid Issue. They are not Addicted to RX opioids, but have been abandoned by their medical providers and Forcibly Titrated. Or, are being forced into MAT medications although they are NOT addicted. Their only option is NO pain medication. They are being left with three options. This is the result of misinformation about Opioids being propagated by the government and news media. Those who have a legitimate need should not be penalized due to the actions of the minority of people who have a problem with Addiction. I can't agree more with the comment from Samantha Adcock. The conflation of these issues has led to desperate suffering by a growing number of chronic pain patients. The government's response has caused the unintended consequence of shortages in injectable opioids used in hospitals for pre- and post-surgical pain management. I have confirmed this shortage with several large hospitals in Louisiana. 1. The CDC quietly admitted that it over-estimated the number of overdose deaths attributed to prescription opioids by as much as 50%. Their new "estimate" (a testimony to the garbage condition of death certificate data) places the number of prescription opioid overdoses at or below levels of annual overdoses from NSAIDs. "Taking a Bufferin" isn't so safe. 2. Now the FDA has discovered flaws in the database used by the DEA to estimate prescription opioid sales. Predictably, the mistakes caused an over-estimation of sales, contributing to the DEA's strategy of reducing opioid pain med production by 45% in the last two years. Result: shortages. I have 2 terminal illnesses, autoimmune diseases and many secondary disorders. I am not having fun with meds. Never one problem in 8 years. Today, I produced a clean urine test and was denied refills. I have no pain meds at all. Why would this happen? Obviously I will be experiencing my first hit of "H". Thanks doc. Thank you to Ms. Alcock & Mr. Yennie—your comments totally hit the mark. For Chronic Pain Patients, our new biggest enemy is the State Medical Boards who have taken the CDC’s GUIDELINES, intended for Primary Care doctors, NOT Pain Specialists, and threatened Board Certified Pain Specialists with arrest and loss of their medical license if they do not comply with the CDC Guidelines, which we now know were derived through erroneous and manipulated data. Our pain doctors are being FORCED to lower every chronic pain patient’s opiate intake to no more than 90 morphine equivalents per day, regardless of the condition for which opiates are required, the length of time the patient has been taking them, the medical necessity of the treatment, or any other myriad factors which good medicine requires to be considered when determining the medically appropriate level of opiates to prescribe a patient. My quality of life has been reduced so low I am not sure it is worth suffering through anymore. Before my doctor was forced to reduce my pain meds, at least I had some days in which I found small joys and small pleasures. I hope the State Medical Boards, using erroneous data and just plain bad medicine by not allowing my doctor to exercise any amount of discretion when prescribing my meds, can go to bed at night happy thinking they may have prevented an imaginary overdose, while not giving a second thought to the rise in suicides which will inevitably result. NIDA. "The True, Deadly Scope of America’s Fentanyl Problem." National Institute on Drug Abuse, 1 May. 2018, https://www.drugabuse.gov/about-nida/noras-blog/2018/05/true-deadly-scope-americas-fentanyl-problem. NIDA. The True, Deadly Scope of America’s Fentanyl Problem. National Institute on Drug Abuse website. https://www.drugabuse.gov/about-nida/noras-blog/2018/05/true-deadly-scope-americas-fentanyl-problem. May 1, 2018.